The ZYPPAH Anti-Snoring Mouthpiece Device is the best and real solution to your snoring. It is FDA-cleared, uses boil-and-bite process, is easily moulded, effective and safe to use. Zyppah! The Best Dual Action, Anti-Snoring Product For You! Snoring frequently can greatly affect the quality and quantity of your sleep and your family members as well. If you don’t treat at the early stages it might affect not only your health but your relationship also. Snoring lowers down your healthy lifestyles and works. It makes you restless, upset, irritating, fatigue and increased health problems. Of course, sleeping in different bedrooms is to some extent helpful but not the real snoring treatment. To overcome your snoring issues, you will find numerous snoring products today and one of the best is Zyppah. It claims to be effective in combating your snoring with its powerful mouthpiece device. It prevents the tongue from falling back to your throat and thus opens up the airways and controls snoring. Use Zyppah and breathe, sleep freely again. It is the Anti-snoring mouthpiece device that provides real solution to your snoring. Zyppah (Happy Z spelled backwards) is an effective, FDA-cleared, easy to use and boil-and-bite oral appliance snoring product. It functions uniquely by using patent-pending elastic, to hold and stabilize the tongue. How Zyppah Snoring Device Works? Zyppah snoring device is proven to work in an additional step to stop snoring from occurring again. It not only gives support to the mouth but also lower jaw to control tongue from falling backwards. It works in two ways to treat snoring problems. 1. It opens the airways by pushing and holding the lower jaw forwardly. As a result the loose tissue across the neck and jaw are being tightened. 2. It uses a powerful elastic band so that tongue is hold firmly and gently in proper place, preventing it from falling back in your throat. Zyppah is regarded as the best alternative snoring solution today. Its dual action smoothen the functioning of the airways. But What Exactly Is This Zyppah Device? Zyppah is an FDA-cleared oral appliance that stops snoring by minimizing throat constriction and tongue movement while you sleep. It does these in two ways — mandibular repositioning and tongue stabilization. Mandibular repositioning is basically moving the jaw slightly forward while you sleep. Snoring is often caused by constriction of the throat, so preventing that from happening can prevent snoring. By keeping your jaw forward while you sleep, Zyppah keeps your airway open and ensures the loose tissues around the jaw and neck are tightened to prevent vibrations. If you’ve looked at other snoring mouthpieces before, you’ve might have seen some called MRD devices. MRD stands for mandibular repositioning, and that’s half of what the Zyppah does. It would be hard to write a review about the Zyppah without mentioning its striking colours; jet black and lime green! Most mouthpiece manufacturers make a distinct effort to camouflage their product using subdued tones in order to lessen the device’s visual impact. Realizing the futility of this approach the makers of Zyppah RX have gone in exactly the opposite direction. They’ve decided to jazz up the look of their device and present a product with pizzazz. Have they been successful? Well you will have to be the judge of that but for the more adventurous snorer; the Zyppah RX will have definite appeal. The material of the Zyppah RX has a nice soft feel to it which is something your mouth will appreciate. The fact that it can be customized to fit easily over your teeth not only makes this device a better fit but also makes it more comfortable to wear. The Zyppah is actually less bulky than some of its competitors. This is a definite plus when an appliance has to be inserted right inside the mouth cavity. The elastic band across the tongue also works as intended and does keep the tongue from slipping backwards. 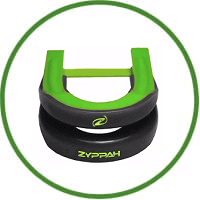 Unfortunately, the Zyppah RX comes in only one size so the fact that this device has less bulk could be easily negated, depending on the size of your mouth. Normally, anti snoring mouthpiece only works one way. Zyppah works two ways, as a tongue retainer and a jaw retainer. This is very unique so I need to tell you how it works both ways. This device is shaped like a jaw retaining mouthpiece. It is two pieces and fits over your teeth. Once it is in position it moves your jaw forward and keeps it there. This keeps your jaw from putting any pressure on your throat or airway during sleep. Pressure causes constriction and constriction leads to snoring. In addition to keeping your jaw pulled forward, this device also holds your tongue in place. Since it is holding your tongue very gently, it cannot fall back towards your throat. When your tongue does fall towards your throat it takes up a lot of space and blocks airflow. Both correcting the jaw and holding the tongue have proven to be effective snoring solutions for some. The fact that this device combines both methods while still being comfortable is a huge step forward. You can see the differences in using Zyppah below. The best place to buy Zyppah is direct from the manufacturer on the official Zyppah website. That’s the only way to ensure you’re getting the real product for the best price. First off, they are accredited by the Better Business Bureau. Secondly, they offer a 90-day return guarantee. That means you don’t have to worry about fraudulent charges or losing money if for some reason Zyppah doesn’t work for you. Are You ready to try it for yourself? With the 90-day guarantee you’ve got nothing to lose, and only better sleep to gain. The Zyppah RX is recommended for anyone over 18 years old who suffers from snoring. If you suffer from sleep apnoea, the company makes a professional device that must be administered by a dentist or physician. When you purchase the device you also receive a very informative booklet with helpful tips on how to get a better night’s sleep and how to enhance intimacy. Who couldn’t use tips like those? Based on their unique approach to opening up your air passages, the affordable price, the countless positive reviews and the risk-free trial offer, I highly recommend the Zyppah RX appliance to stop your snoring and help you (and your partner) get a good night’s sleep.